Are you looking for a sweet treat, that will crave you sweet craving, and will make you feel good about giving back. 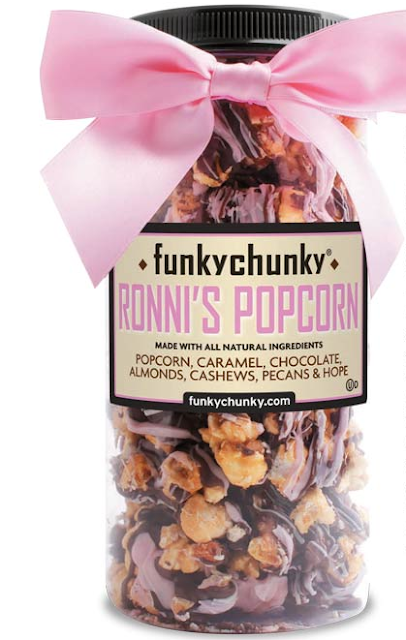 I would like to suggest picking up a container (or two) of FunkyChunky’s new flavor Ronni’s Popcorn. Here is a little more information about the popcorn snack and Ronnie. Ronni Feuer, the founder and creator of FunkyChunky, was a wife, mother, grandmother entrepreneur, artist and chocolatier. 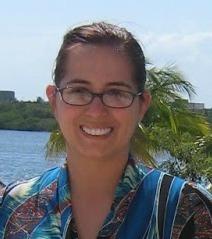 Like millions of women, Ronni also fought breast cancer. As a tribute to Ronni – and all women whose lives have been affected by breast cancer – FunkyChunky is proud to introduce a Special Edition of her signature FunkyChunky Popcorn – Ronni’s Popcorn. This special edition flavor is made with all natural ingredients and contains buttery caramel corn, whole glazed almonds, cashew and pecans and then topped with dark, milk and pink chocolaty drizzle. For every purchase 10% of sales will go to the Hope Chest for Breast Cancer Foundation, with 100% of every dollar raised going directly to women facing financial hardships while undergoing break cancer treatment. Hope Chest is a Minnesota based company that works to relieve local breast cancer patients and their family of financial distress so they can focus on what is more important—healing. The special edition flavor, Ronni’s Popcorn, is hand-crafted in small, made-to-order batches and packaged in clear canisters to display the combination of ingredients. Ronni’s Popcorn is OU Dairy certified kosher and comes in a tall 20oz canister. Retail price is $22.00. Other products in the FunkyChunky line include FunkyChunky Chocolate Popcorn, FunkyChunky Chocolate Pretzels, FunkyChunky Caramel Corn, FunkyChunky Peanut Butter Pretzels, FunkyChunky Chip-Zel-Pop, FunkyChunky Sea Salt Popcorn, FunkyChunky Candy Bars and the seasonal FunkyChunky Candy Cane. So what did my family think of this inspirational popcorn? Well when it arrived the package was very pretty to look at the popcorn was tied with a lovely pink bow, that could be re-used, my daughter claimed it for her ponytail. As soon as the packaged arrived I could not wait to try the delicious looking popcorn. I loved the “pink” white chocolate drizzle. The popcorn had just the right amount of nuts and chocolate. I was also able to bring the large container over my in-laws we went over for dinner and I brought the dessert treat. They all loved this, and after I told them a little more about Ronnie and what the popcorn was raising money for, they loved the treat that much more. If you are looking for a great sweet treat, you will love this popcorn. You will feel good, knowing 10% of your purchase is going to help with Brest cancer research. Disclosure: The reviews and or opinions on this blog are my own opinions . I received popcorn to review. No monitory compensation was received. I was not required to write a positive review. Your experience may differ. The opinions I have expressed are my own I am disclosing this in accordance with the Federal Trade Commissions 16 CFR Part 255: Guides Concerning the Use of Endorsement and Testimonials in Advertising .